Can Hamsters Eat Timothy Hay? Providing hamsters with a nutritious, balanced diet is one of the basics in proper hamster care. Offering the wrong foods can lead to hamster obesity, nutritional deprivation or even death. 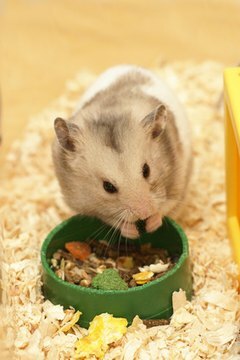 Knowing which foods are safe for hamsters, and in what quantities, increases the likelihood your hamster will live a long and healthy life. A balanced diet is required to meet all of a hamster's nutritional needs, and the staple of that diet is a specialized pellet mix. According to the American Society for the Prevention of Cruelty to Animals, the cornerstone of a proper hamster diet is a commercial hamster feed, available at any pet store. These mixes contain seeds, grains, cracked corn, and pellets, all of which are necessary to meet a hamster's minimum nutritional requirements. Hamsters should be fed this mix daily. Every two to three days, hamsters should be offered fresh fruits and vegetables as a supplement to the commercial pellet mix. Spinach, lettuce, carrots, cauliflower and apples all are healthy options. These foods tend to spoil quickly, so proper cage cleaning also is important to maintaining a hamster's overall health. The ASPCA also recommends avoiding other fresh foods, such as onions, raw potatoes and rhubarb, as these foods pose short- and long-term health risks to hamsters. An excellent source of minerals and fiber, timothy hay is a staple component in many animals’ daily diets, fulfilling a variety of nutritional needs. Timothy hay aids in maintaining a healthy digestive tract, promotes dental health and regulates weight. While not nutritionally necessary for hamsters, timothy hay is a safe and healthy supplement that can be offered two or three times a week, and should be part of a hamster’s overall balanced diet. In addition to its nutritional value, timothy hay is an excellent source for hamster bedding. The Humane Society of the United States cautions against using commercial pine and cedar bedding for small animals, such as hamsters, because of health concerns associated with those products. Timothy hay offers a safe alternative to those harmful bedding options, and can be purchased easily at most pet and grocery stores.